On Friday, search and rescue teams painstakingly worked their way through trees knocked down by 155-mph winds and the mounds of debris left behind after a wall of water up to 14 feet high slammed into several communities along the Gulf Coast. The storm hit Florida, Georgia, the Carolinas and Virginia, leaving at least 12 people dead. "Unfortunately, I think you're going to see that number climb," Federal Emergency Management Agency Administrator Brock Long said in a news conference Friday afternoon. "We still haven't gotten into some of the hardest-hit areas." Flooding caused by the Category 4 hurricane washed out some roads and bridges, while others are impassible because of high standing water, downed power lines and massive amounts of debris, hampering search and rescue operations, and delaying the delivery of vital supplies to stranded residents. Long says Hurricane Michael inflicted a lot of damage on the Florida Panhandle's infrastructure. "Communications, transportation and hazardous materials, that's where we're focused right now." FEMA works ahead of time with the National Guard, state governments, utility companies, the private sector and nonprofit relief organizations to set up transportation and distribution networks — but those involved in the relief and recovery efforts say this storm came in quick and packed a wallop that is complicating the response. The American Logistics Aid Network was created after Hurricane Katrina to better coordinate logistics between public, private and humanitarian organizations. Its executive director, Kathy Fulton, says that "in order to get supplies into a disaster area, you have to have some form of logistics support, whether that's ground transportation, air transportation, whatever that may be." 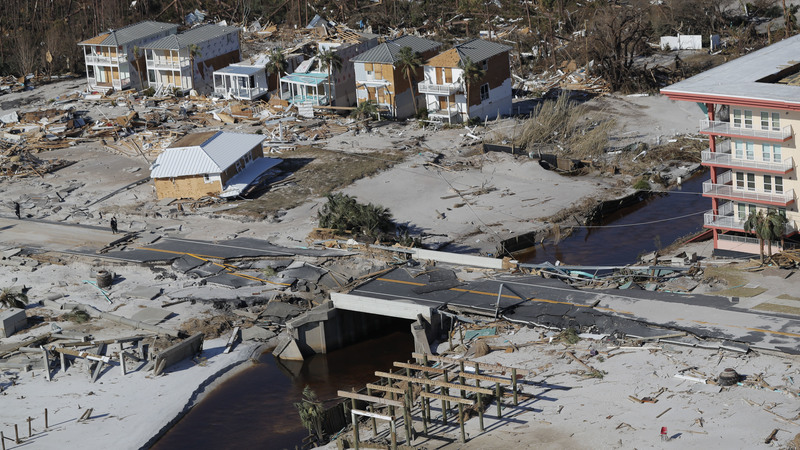 But Fulton says Hurricane Michael knocked out a lot of the infrastructure that's needed to get the supply chain moving and get life-saving resources into devastated communities. "Stuff like power, water, communications and the road infrastructure ... in order to operate modern supply chains, we rely on all of those things," she says. But "there's significant, not just disruption to those infrastructure, but destruction." Fulton says those logistical (and literal) roadblocks can change the priorities of what kinds or supplies and equipment need to go in first. For example, she says, food and water are critical, especially when grocery stores and food banks have been destroyed and drinking water systems damaged or contaminated — but crews with chainsaws and bulldozers need to go first to clear roads so the trucks with food and water can get through. "Obviously, life-saving commodities are going to be the things that get the biggest priority right now," says Fulton. "It doesn't do any good to provide power and air conditioning or light if people don't have food in their stomachs." But when search and rescue and medical teams are needed, the ability for those emergency responders to communicate might be paramount. Fulton says studies of the response to Hurricane Maria in Puerto Rico last year suggest that "we were pushing in food and water, when really what we should have been pushing in was communications equipment." "Organizations do get stretched," Fulton says, "and there were still things happening from last fall's events (hurricanes Maria, Irma and Harvey) that all of our organizations have been working on. Without good volunteer support, without the business community stepping up ... that work would not get done." Commercial shippers in the region also are being stretched thin by the hurricane, and many shipments are delayed because of storm damage. And on land, some highways are closed or open only to essential traffic, says Randy Ofiara, a vice president at Tampa-based BlueGrace Logistics, which helps companies manage their supply chains. In addition, "shipping terminals are shut down and carriers place embargoes," meaning shipments may not move through storm-affected areas for some time: "For example, if I pick up a shipment in California that's bound for Tallahassee, that carrier may say, 'Hey, I will move this as close as I can, but I'm not going to deliver it until it's free and clear to deliver into Tallahassee once we know — once we get the green light from all the rescue efforts that are going on and the businesses start reopening'." Ofiara says that can affect a huge range of businesses, such as Midwestern manufacturers waiting on delivery of parts or grocers in the Northeast that need fresh oranges. "If you're waiting on a product that maybe is coming through the Port of Miami, it's not going to be able to get up through the Panhandle right now and get up into the Midwest and Chicago and then be distributed," he says. "So you will see delays." Consumer prices may be affected, too, as shipping goods into and out of the region is becoming more expensive. Ofiara says his costumers are already seeing a 50 percent spike in costs for moving shipments out of or through Florida. "That means if you're a grower and planning on a per-truck shipment of oranges costing $500, today's rate is now $750," he says. That's partly because of the hurricane response efforts, he adds, saying that there is already a shortage of truck drivers across the country. "When FEMA moves in with recovery efforts, they will pull from the same commercial market, the available capacity in the marketplace for trucks, to move the medical supplies and relief supplies into those regions." "FEMA typically pays a premium to move supplies on trucks," Ofiara says. "So you have this tightening of capacity that happens, which in turn drives rates up." With this being harvest time for pecans, peanuts and cotton in the Southeast and holiday shipping to stocks stores and e-commerce distribution centers approaching, Ofiara says it's not a great time for a further tightening of shipping capacity. But he doesn't expect shipping delays and price increases to last long.